Finding the right relationship for you seems simple. It seems that way because it is, if you follow a few guidelines. 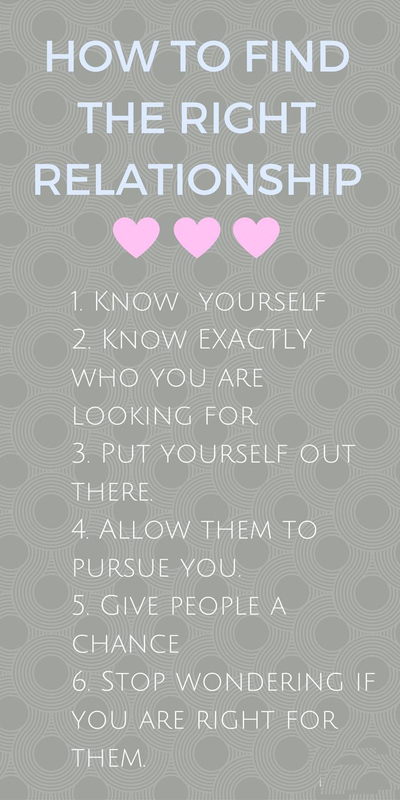 Step Two: Once you know yourself, know what you are looking for. Do you want the nightlife with clubs and dancing or would you prefer quiet evenings of dining and conversation. Step Three: Get out. Go to the kind of place you would like to go on a date. Pursue your interests. Step Four: Allow people to meet you. Don’t be so stand-offish that no one will approach you, even to ask for a straw or matchbook. Step Six: Don’t wonder if you are right for them. Put yourself first. The most important thing is to cherish yourself as much as you would like to be cherished.